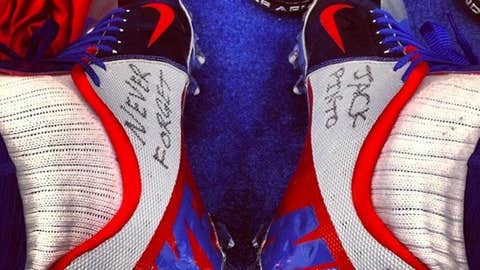 Victor Cruz is paying tribute to Jack Pinto, the six-year-old boy who was killed in the Sandy Hook Elementary School shooting last year, during today’s game against the Seahawks. Cruz was Pinto’s favorite player and the wide receiver has since developed a strong bond with the Pinto family. He visited Newtown shortly after the tragedy last year and later made another trip to the town with other members of the Giants. Saturday was the one-year anniversary of the Sandy Hook tragedy.